Everyone wants to get back down to that optimal weight now that the holidays are over, and the diet and weight loss companies know that. They are offering great deals right now to encourage you to try their weight loss plans! With that in mind, try checking out the companies that are most appealing to you for New Year's deals and steals! Here are 2 great deals from reputable weight loss companies to help you get to the weight you're hoping for! 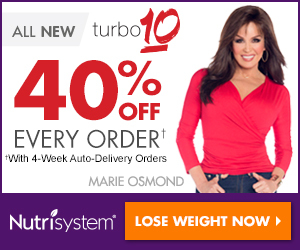 Nutrisystem - Made popular by spokesperson, Marie Osmond, where they guarantee that you can lose 10 lbs. & 5 inches overall in your first month! Sign up to get a free shaker bottle and free tips and weight loss info. For a limited time, get 40% off every order + free shipping! Get the details here! Daily Burn - An online resource full of diet tips, recipes, and workouts. Try it for 30 days free. I'd personally get it just for the workouts! Choose from yoga, Inferno, Move dance, and much more! With these two programs, you could find yourself in a very good position to head into spring in better shape than you've been in awhile! Good luck! I know I will be looking into some of these great companies and making some strategies! This site accepts product samples and/or compensation. Affiliate links may be used to help support this site. All text and opinions are my own and are not swayed by any sponsor affiliation.